Fantastic location. Comfortable apartment which is well equipped although the kettle needs replacing as does not switch off automatically. The room had what we wanted for self catering, it is in a very good location for the city centre, and for us a good position to easily enter and leave the city. Some restaurants nearby on walking into the centre, and there is a Waitrose just over the Pulteney Bridge on the right hand far side for provisions. A very pretty room with a lovely view across the gardens to Bath Abbey. 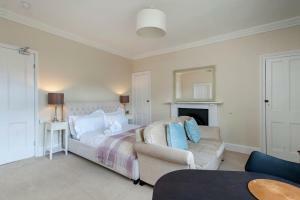 Beautiful furnishings, an extremely comfortable bed, a sofa to sit and look at the view (or watch TV) from. All the fittings were of excellent quality as was the crockery and kitchen equipment. We were greeted warmly by Arthur as we arrived and were able to thank him as we left. The room was clean and tidy with great factilities. The welcome and the communcation from the staff was superb. I love this house, cozy and warm, 10 minutes walking to the visitor center, easy check in and check out. I should have stayed more days, much beyond my expectation. It was a great room in a fantastic location and I enjoyed the experience. True value for money in Bath.Fabulous view.Well appointed room.Spotlessly clean.Comfortable 4 poster bed.All one could wish for to make a stay enjoyable.Wish we had booked for a longer stay.It will be our first choice when we return in the Spring. Lovely room, considerate host, comfortable bed, easy walk to town. Lock in a great price for Number 17 Bath – rated 8.9 by recent guests! One of our best sellers in Bath! In the heart of Bath, a 10-minute walk from Bath Train Station, Number 17 Bath is a 19th-century boutique townhouse located just 1,300 feet from restaurants, bars and shops. 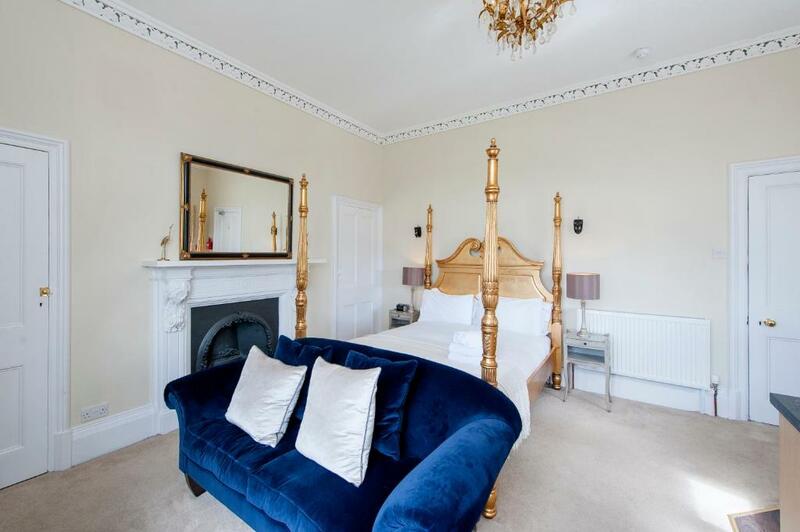 Each of the 7 self-catering units are located within 1 building and offer private bathrooms, marble fireplaces, Victorian ornaments such as gold mirrors and chandeliers, and period features such as bay windows. Each self-contained unit offers modern facilities including fully equipped kitchens, flat-screen TVs, and iPod docking stations. Each apartment has a shower room, hairdryer and ironing facilities. Parking is available in our off-road car park, or there is on-road parking using permits, with 1 parking space per unit only. 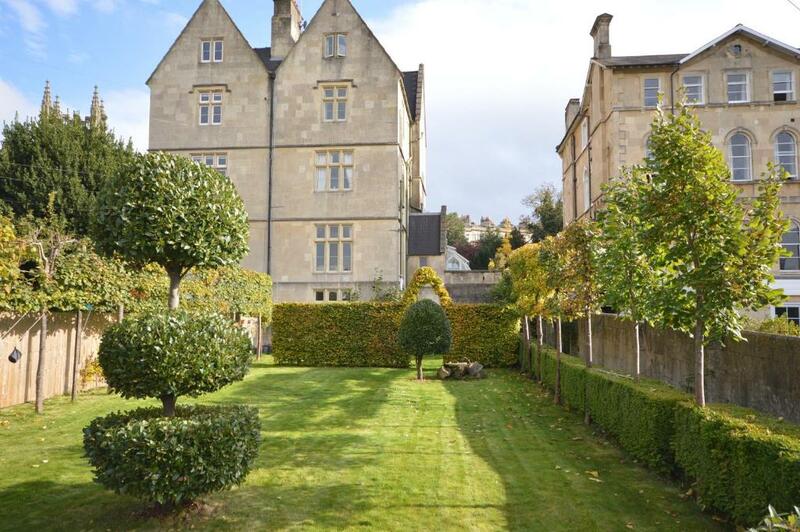 Built in 1873, Number 17 Bath has beautiful gardens backing onto Bath Recreation Ground, and features views of Bath Abbey and the city. Pulteney Bridge and the Roman baths are all a short walk from Number 17, as are numerous beautiful canal walks, parks, café’s and museums. 뀐 Located in the top-rated area in Bath, this property has an excellent location score of 9.4! 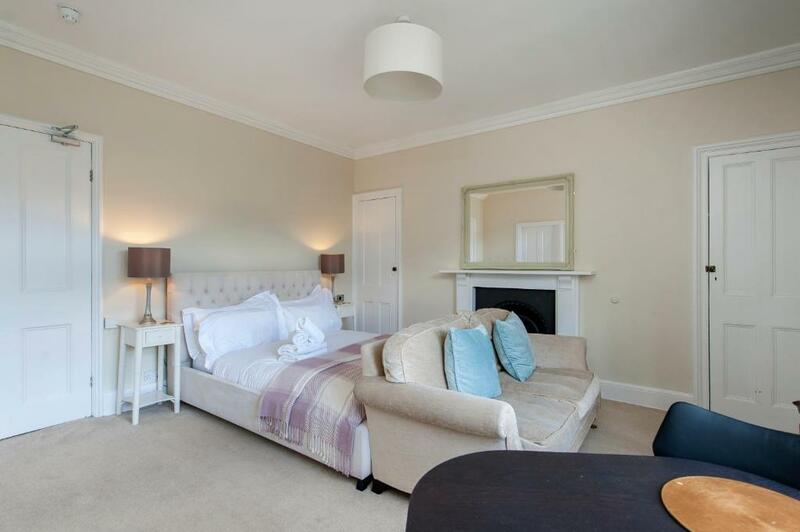 When would you like to stay at Number 17 Bath? Furnished with a large king-size bed and sofa, the room has an en-suite shower room with electric shower and a kitchenette with hob/cooker and kettle. All linen and towels are provided. There is free WiFi, a flat-screen TV with Sky channels, a hairdryer, iron and ironing board. Please note only tea and coffee are provided, no milk or food. This accommodations is not suitable for guests with mobility issues. Blue Moon studio is located on the first floor to the rear of the property looking out over the recreation ground to Bath Abbey. Furnished with a gold king-size four-poster bed and a sofa, the room has an en-suite shower room with electric shower and a kitchenette with an oven and a kettle. All linen and towels are provided. This studio is located on the ground floor to the front of the building and has a large double glazed glass conservatory. The apartment has a walk-in wet room and separate en-suite toilet, sofa and bedding, and a king-size bed. All linen and towels are provided. 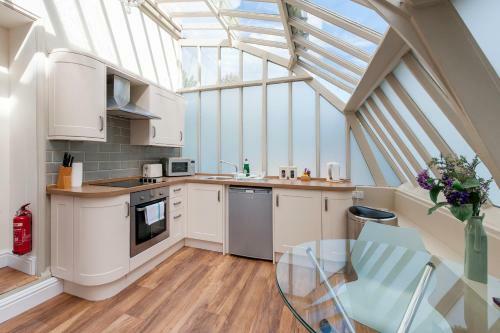 The kitchenette is located in the conservatory with table and chairs for dining and includes oven, microwave, kettle and basic cooking equipment. 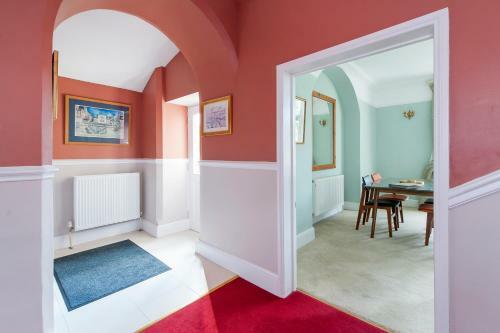 Maggi’s Room with attached bathroom is located on the ground floor to the rear of the property looking out over the recreation ground to Bath Abbey. 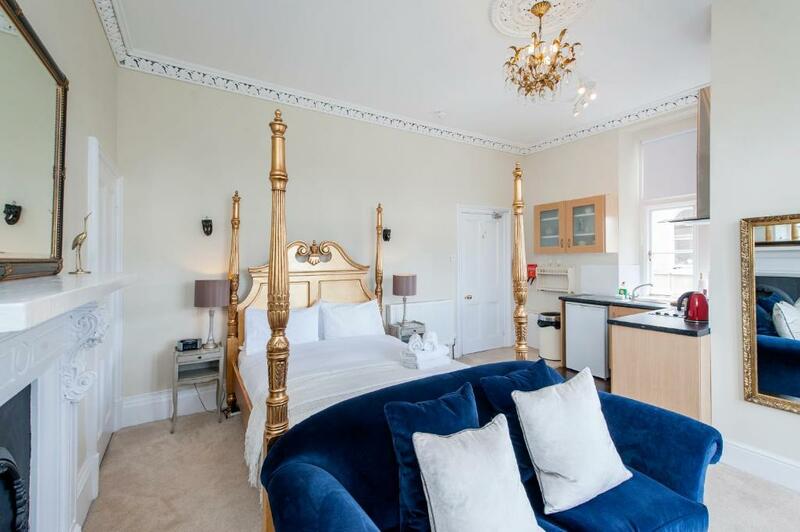 Furnished with a king-size bed, a sofa and gold and silk damask curtains, this room has an en-suite wet room, It also includes tea/coffee making facilities, wine glasses, a microwave and a mini fridge. All linen and towels are provided. This apartment is located at ground level to the rear of the property building and at basement level to the front, with an extensive garden. The apartment occupies a whole floor of the hotel. Inside, there is a bedroom with a king-size bed and another with twin beds that can be arranged as a double bed on request, a separate living room, kitchen and bathroom. All linen and towels are provided. The kitchen is equipped with a dishwasher and full cooking facilities, and the bathroom has a full-sized bath and shower. Please note only tea and coffee are provided, no milk or food, and that this accommodations is not suitable for restricted mobility. Furnished with a king-sized bed and sofa, the apartment has an en-suite shower room with electric shower and a kitchenette with hob/cooker and kettle. All linen and towels are provided. There is free WiFi, a flat-screen TV with Sky channels, a hairdryer, iron and ironing board. Please note only tea and coffee are provided, no milk or food. This accommodations is not suitable for guests with mobility issues. In Central Bath with one parking allocation per unit included with your reservation, our building overlooks Bath Recreation ground with fantastic view to Bath Abby. With larger than normal rooms our studios feature, king size beds with The White Company bedding and towels, sofa seating areas with HD TV and sky programme, small kitchenettes with cooking facilities and utencils and private bathroom / shower room. Free WIFI is available throughout the premises Our accommodations are versatile in accommodating larger groups in one location (just add more rooms) as well as being highly suitable for 2 person short get aways Featuring large marble fire places, chandeliers, as well as a large private garden available to all guests, our location is one of the most convenient for business travellers, individuals, families, two person and group bookings. We benefit from having our own off road car park to the front of our building. This has space for parking for 6 of our 7 units with the final arrival using local on road parking in the zone 1 parking bays in surrounding area adjacent to the building There are lots of restaurants and local shops with in 250 meters of the building such as the restaurants at Pulteney Bridge, Sotto Sotto is also a very short walking distance and there is a local Tesco metro a short 25 m walk just accros the road. House Rules Number 17 Bath takes special requests – add in the next step! Number 17 Bath accepts these cards and reserves the right to temporarily hold an amount prior to arrival. Please let Number 17 know your expected arrival time. You can use the Special Requests box when booking or contact the property in advance using the details stated in the booking confirmation. Please note that there is 1 parking space available per apartment. Please inform Number 17 Bath of your expected arrival time in advance. You can use the Special Requests box when booking, or contact the property directly using the contact details in your confirmation. Kitchen sink and bathroom not entirely clean. Poor pillows that kept falling down behind headboard. Great location, nice room and view. Nice teas and snacks left in the kitchen. Very comfortable large room. Excellent facilities. Excellent location. Great location, 10 minute walk into city. Lovely space and gorgeous building. Slightly foot heavy upstairs neighbours, but no 17 itself, a haven. Good room, great view and location, lovely en suite. Honestly I thought I was booking a hotel, but when I realised I didn’t mind and the place itself was a delight. Characterful and luxurious without being intimidatingly perfect the way some boutique hotels can be. A lovely stay, and great place to explore the city and the region from. I definitely hope to come back and will recommend it to friends and family alike. Only three spoons for our breakfast but four beds. Could have done with more mugs. But no other negatives. We got to use the netflix which was very exciting. Nice and quiet and convenient. Seems well thought through. Lovely building. We didn’t find the bed very comfortable. Would have been nice to see have a blind at the bathroom window as you feel a bit exposed in shower. Beautiful big old house. Amazing comfy bed. And such a handy location! Great size room, nice view out over the local green space, really friendly staff, convenient location to train station and town. You need 'a knack' when you flush, which was not good. When we used a spa bath first, furs(scales) came out. Warm welcome from Arthur after a long journey was one of the best. We went out to the garden directly from our rooms, stretched out our legs and enjoyed a nice view of Bath Abbey. There were lovely magnolias in their blooms. I opened up the oven to find a dirty tray, fortunately a sponge and liquid was available to clean it. The mattress was awful. It was too soft for us and we kept sinking into it. If we were to stay here again we would only do so if they had a better mattress, the mattress was very flimsy and thin. The location was great. The style of the room was great and it had all that we needed. We left our charger in the room which the owner kindly posted it to us.